Providing equine veterinary medicine and surgery that makes a difference for our patients, their owners, and the veterinary community. Dr. Paul McClellan is a graduate of Purdue University School of Veterinary Medicine. It was his good fortune to have attended a university that placed a premium on instructors who were patient and devoted to their students. It was Dr. William Henderson who introduced Dr. McClellan to the wonderful environment of Northern San Diego county and in 1982, shortly after receiving his veterinary degree, Dr. McClellan moved to the west coast. Performance horse medicine was a growing and rapidly evolving science for equine practitioners in the early 80’s and Dr. McClellan saw it as a perfect fit for his interests. He has devoted his entire career exclusively to the challenges of performance horse medicine. Early in his career, he spent time under the tutelage of Dr. Charles Allen and later with Dr. Danny Marks. Both were highly regarded practitioners and proved to be great mentors to Dr. McClellan. The use of sophisticated technology to enhance indispensable clinical skills has been championed by Dr. McClellan. As a result, he has been an advocate of diagnostic ultrasound, scintigraphy, and MRI. Dr. McClellan produced several papers on the use of diagnostic ultrasound in the early 80’s, encouraged by his association with Dr. Norm Rantanen. In 1990, Dr. McClellan was invited to serve on the USEF Drugs and Medications committee, a position he still holds. He is also an FEI veterinary delegate for the United States in jumping and dressage. Through the years he has had the pleasure of working with horses at the highest levels of competition in racing, eventing, dressage, and jumping. The names of stalwart champions and numerous other competitors are indelibly imprinted in his memory of unforgettable moments. Aside from the pursuit of excellence in his vocation, Dr. McClellan has spent time in a variety of mental and physical activities in an effort to stave off the effects of aging. None so far has shown much promise, but currently he finds interests such as music, hiking, writing, and gardening much more relaxing and a lot less costly than a psychiatrist. Dr. Mike Manno received both his Masters and DVM degrees from Purdue University School of Veterinary Medicine. Prior to graduation in 1981, he was a research instructor in reproductive physiology and taught graduate level biochemistry, veterinary physiology, and pharmacology courses at Purdue. He also worked as a surgeon in the NIH Department of Heart, Lung, and Blood Institute in Besthesda, MD doing cardiac surgical research, including intrauterine fetal cardiac surgery. Since 1982, Dr. Manno has worked on the racetracks and polo fields in Chicago, Northern and Southern California. He has completed courses in both basic and advanced arthroscopic surgery and orthopedic fracture repair. Outside interests include hiking, water and snow skiing, scuba diving, and polo. Dr. Rebecca James graduated from UC Davis School of Veterinary Medicine in 2008. Prior to that, she received her Bachelors of Science degree in Animal Science with an equine emphasis. After graduating from Veterinary School, she completed a 1 year internship at San Luis Rey Equine Hospital. In 2012 she attended Options for Animals College of Animal Chiropractic and became certified by the International Veterinary Chiropractic Association. Dr. James is interested in equine orthopedics (especially as it relates to performance horses), equine medicine, and animal chiropractic. A native of Long Beach, Dr. James truly enjoys the Southern California lifestyle. Her other interests are traveling, riding, running, hiking, and reading a good book. Dr. Jessica Robertson is a graduate of UC Davis School of Veterinary Medicine. She completed her undergraduate degree from the University of Michigan with a double major in Sociology and Spanish. After undergrad she joined the Peace Corps where she became interested in veterinary medicine and especially working equids. That experience combined with her childhood love of horseback riding lead her to pursue a career in veterinary medicine. 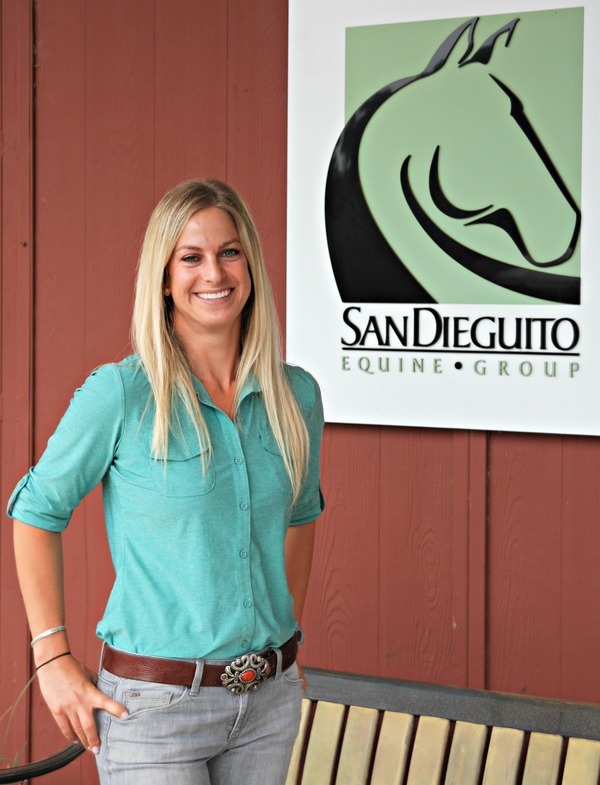 Jessie has a strong interest in equine sports medicine, and looks forward to growing here at San Dieguito Equine Group. She is also excited to be near her hometown of Encinitas, and spend more time with her family. In her free time she enjoys hiking, traveling, snowboarding and scuba diving. 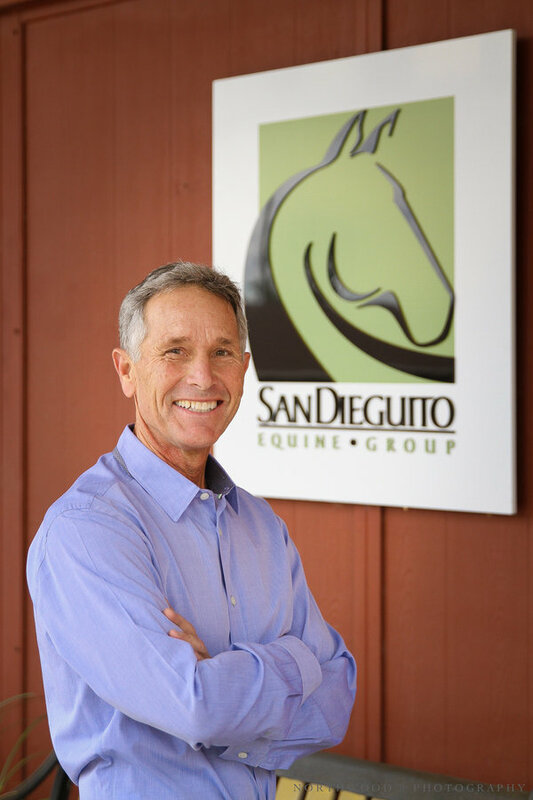 Dr. Brett Robinson developed a passion for horses growing up as an avid three-day eventer based in Southern California. She graduated from Georgetown University with a B.A. in psychology, and then attained her DVM at Cornell University in 2015. In her senior year of vet school she achieved certification in veterinary medical acupuncture from Colorado State University. After graduating from veterinary school, she completed a one year rotating internship at Littleton Equine Medical Center in Colorado, and then worked as an associate in an ambulatory practice north of Denver. Dr. Robinson loves learning and developing as an equine practitioner and has special interests in acupuncture, regenerative medicine, and emergency. In her free time she practices yoga and enjoys outdoor activities with her dog Cali, including hiking, camping, and traveling. Dr. Robinson is thrilled to be returning to her home state as a member of the SDEG team and looks forward to serving its fantastic clientele! Dr. Paul Bienz graduated from Western College of Veterinary Medicine in 2017. He received his Bachelor of Science degree from University of the Fraser Valley located in Abbotsford British Columbia. Paul is a native of Colorado and it was there on his family ranch that he decided to pursue a career in veterinary medicine. Prior to entering veterinary school, while gaining work experience, Paul was influenced by Dr. Neil McKenzie to pursue a focus in equine dentistry. 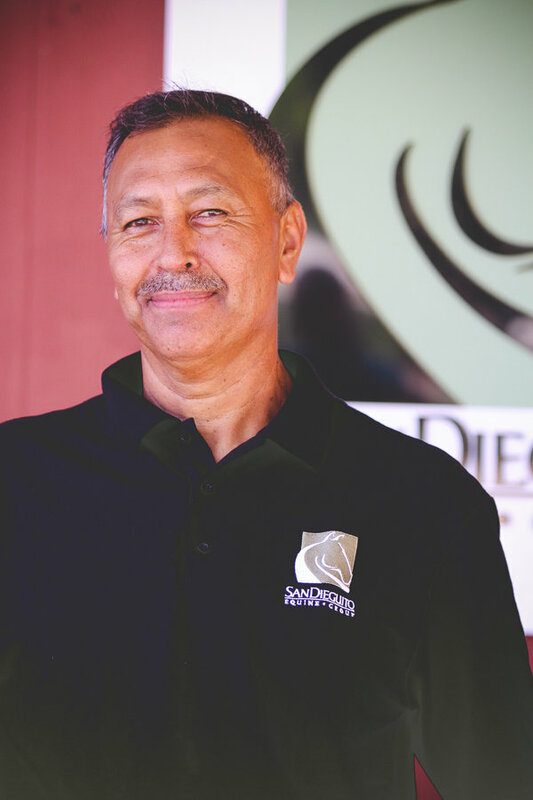 It was this passion for dentistry that brought Paul to San Dieguito Equine Group. Together with his wife, two children and troublesome Frenchie, he looks forward to calling southern California home. Dr. Lindsey Lewis is a 2008 graduate of Purdue University School of Veterinary Medicine. She completed a B.S. in Biology/Neurology from UC Davis in 2002. She has a strong interest in Equine Lameness and Medicine. Lindsey grew up in Del Mar and began riding huntseat when she was 8 years old. Riding and owning horses all her life fueled her interest in maintaining their health and performance. Lindsey enjoys doing relief work for local veterinarians as well as maintaining her own veterinary practice. She currently owns an off-the-track thoroughbred rescue named "Payton". She is also an avid runner and loves spending time at Dog Beach with her Boston Terrier "Quincy". Jennifer McKinney received her B.S. in Agriculture Sciences and Management, Animal Science emphasis, from U.C. Davis. She started working as a veterinary technician in 1988 and got her CA RVT license in 1991. 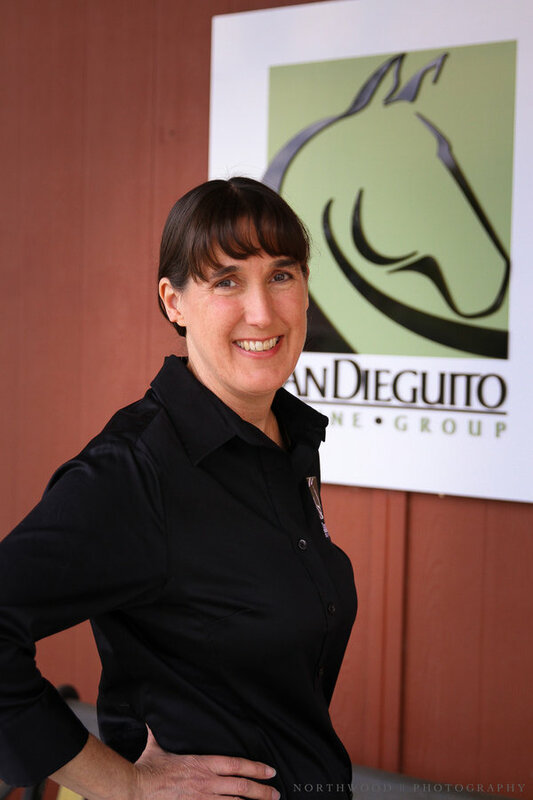 She worked at Helen Woodward Animal Hospital in the equine department for 13 years before joining San Dieguito Equine Group in 2001. Jennifer’s interests include gardening and spending time with her family. 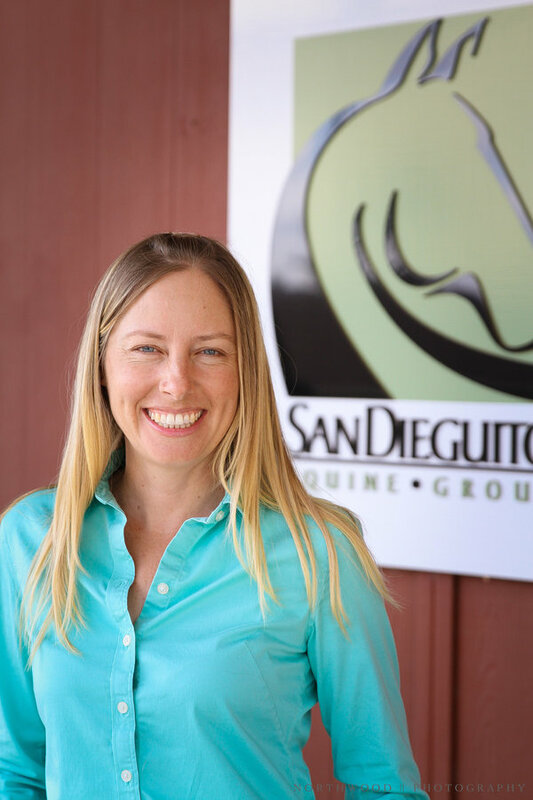 Nicole holds a Bachelor of Arts Degree and is a registered veterinary technician that has worked for San Dieguito Equine Group since 2008. 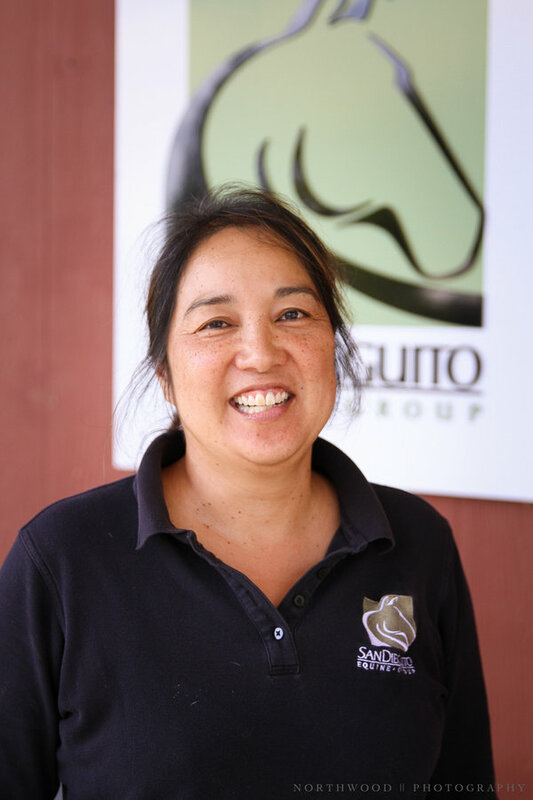 She primarily works in the ambulatory section of the practice but also holds certification and performs standing MRI’s at San Dieguito Equine’s Imaging Center. Nicole is also a representative for the American Association of Equine Veterinary Technicians (AAEVT) and works nationally with its members. As a representative of AAEVT she works with a team to provide continuing education opportunities to technicians across the nation. Nicole has always had a passion for horses and has been riding since a very early age learning how to ride in the United States Pony Club program. On her free time she enjoys hiking, biking, camping, and riding horses. Although Sue's first love has always been horses, she received her B.A. in English and went on to work in the legal field. She eventually left the corporate world to earn an A.S. in Mesa College's Animal Health Technology program. Sue is a registered veterinary technician in the state of California and her previous experience includes working in small animal practices and veterinary hospitals. Her main focus will be assisting with treatments and diagnostic procedures performed at San Dieguito Equine Group's clinic. Sue enjoys riding her horse, reading a good book, swimming, taking off-roading trips with her husband, and spending time with her dogs and cats. Sadie completed her Bachelor of Science degree in Agriculture with an emphasis in Animal Health Science in June 2013. She then passed the California board exam for her Registered Veterinary Technician license the same summer. She has always had a passion for animals, especially for horses and has been competing since the age of 12 in dressage, jumping, and eventing. When she is not working, she is riding and training her seven year old Thoroughbred Gitano, hiking with her Pit Bull Xena, or playing beach volleyball. 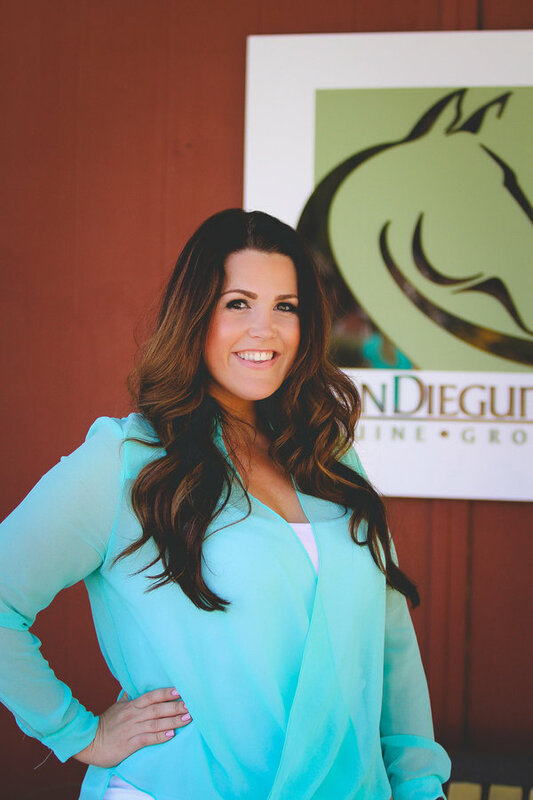 Jenna joined the San Dieguito Equine Group team in June of 2014 as an ambulatory and surgical technician. Jenna grew up in Marin County, California and has been riding since the age of three. She has competed with jumpers as well as eventing and dressage. She is a graduate of the United States Pony Club. Jenna attended UC Davis graduating with a Bachelor’s of Science in Equine Studies, with a focus on Equine Nutrition. While in college, Jenna worked at the UC Davis Veterinary Medicine Hospital Large Animal Surgery unit. Jenna has worked in Equine Ambulatory Medicine since graduating from college in 2010. Jenna returned to school at Santa Rosa Junior College attending their Veterinary Technician program and received her RVT license in November 2014. Jenna is excited to be part San Dieguito Equine family. Her professional interests include surgery and anesthesia, MRI and advanced imaging, and critical care. When not at work, Jenna enjoys spending time with her husband, John, her horse Comic, and her friends. Her favorite pastimes include reading a good book and baking. Stephanie is a San Diego native who grew up in the local horse community. She attended Cal Poly San Luis Obispo and Arizona State University focusing on Human Development and Psychology. She along with her family compete on the American Quarter Horse Association circuit and have an active breeding program. Stephanie previously worked in the small animal industry and is excited to combine her passion for marketing and horses. She and her husband, Dominic enjoy working on their home, participating in car shows and spending time with their dog Bones. Stephanie is an active member on the Twin Oaks Valley Equestrian Association board of directors - dedicated to preserving open space for equestrian recreation. Susan Conrad joined SDEG in 2005 and quickly became an integral part of the administrative team. Susan has been working in the horse industry for more than 20 years, though she has owned horses for her entire life. Susan’s interests include hanging out at the barn, going to horse shows, camping, spending time with her daughter Sierra. 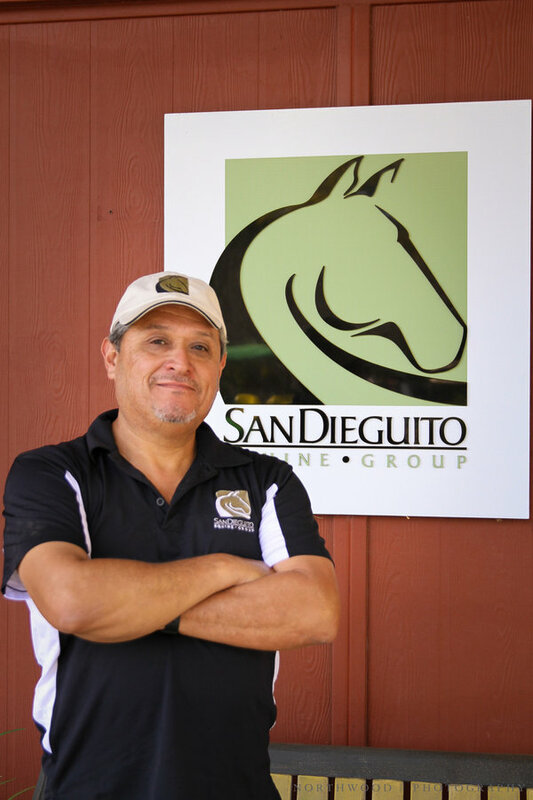 Lupe joined San Dieguito Equine Group after a long career working with performance horses as a groom. He is responsible for ensuring the best daily care for all the horses seen at the imaging center. In addition to his responsibilities as a groom, he is also very involved with assisting the veterinarians and technicians with clinic procedures as well as providing basic farrier needs associated with advanced diagnostic procedures. He also assists the doctors and technicians in handling horses during orthopedic evaluations and imaging procedures. Lupe's experience is a great asset when a nervous horse needs to be settled by a confident and careful handler. Lupe spends his free time with his wife and three kids. He enjoys playing basketball and swimming. 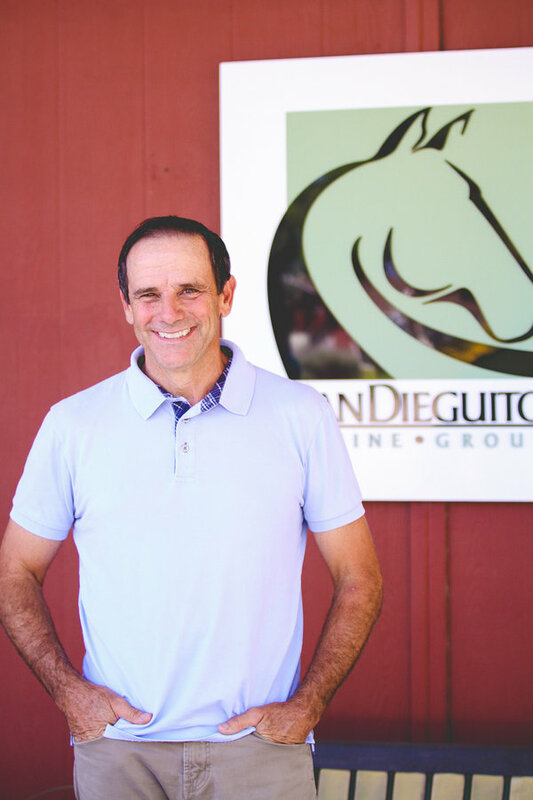 Rafa joined San Dieguito Equine Group after a long career in the thoroughbred racing industry where he worked as a groom. He is responsible for horse care, stall management, assisting doctors with orthopedic evaluations, and assisting with advanced imaging procedures. His love for the horse is obvious in all that he does. He loves to learn and is always keeping his eye open for ways he can improve his skills. He completed his education in Mexico and has been working with horses for over 25 years. He enjoys taking part in activities that will allow him to learn and progress in his field and also enjoys spending time with his family. 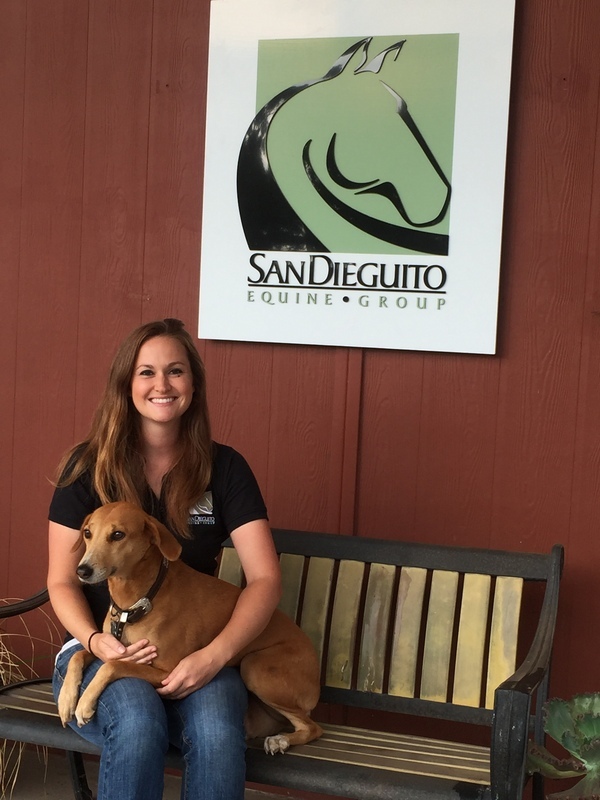 San Dieguito Equine has been like a second family to Zoe growing up with the practice, she is excited to join the team as a full-time veterinary assistant, as she works towards becoming a Registered Veterinary Technician. Zoe has grown up with horses and has been competing in various disciplines from a young age. Being exposed to three day eventing in the United States Pony Club, Zoe now competes at the Preliminary/1* level with her horse Tristan, while bringing along her young horse Tessa. When she is not working, Zoe can most always be found riding, baking, or exercising outdoors. © 2015 San Dieguito Equine Group. All Rights Reserved.